HOUSTON (AP) — His daughter standing behind him, former President George H.W. Bush sat at the front of the cavernous sanctuary of St. Martin’s Episcopal Church. He gazed up at the rose-draped casket holding his wife of 73 years. 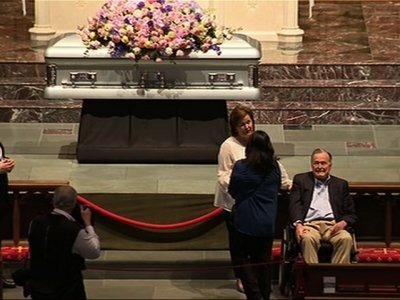 After a few moments, an aide came forward to help Bush with his wheelchair, turning it so he faced the rest of the sanctuary. A string of mourners began to approach: adults and children, many of the women wearing his wife’s favorite color, blue, and trademark pearls. He offered his hand and smiled as people shook it. By Friday evening, officials said around 2,500 people stopped by to pay their respects to Barbara Bush, wife of the nation’s 41st president and mother of the nation’s 43rd. Among them was Houston social worker Varney Johnson, who like other mourners said he wanted to honor her work supporting literacy. “This woman dedicated her life to educating children,” he said. Barbara and George Bush were married longer than any other presidential couple when she died Tuesday at their home in Houston. One of just two first ladies to have a child elected president, Barbara Bush was widely admired for her plainspoken style and her advocacy for causes including literacy and AIDS awareness. A hearse containing the former first lady’s casket arrived before daybreak at St. Martin’s, which is the nation’s largest Episcopal church. Her body was to be in repose from noon until midnight. A spray of dozens of roses covered the closed light-colored metallic casket. The 93-year-old former president arrived at the church shortly after the viewing opened, accompanied by daughter Dorothy Bush Koch. He hadn’t been scheduled to visit, but he decided to go after watching video from the church, said family spokesman Jim McGrath. Bush shook dozens of hands and stayed for about 15 minutes. Lucy Orlando was one of the more than 100 people in line well before bus service began from a separate location to the church. Originally from Haiti, the 74-year-old Orlando had traveled from Weston, Florida, and said she has admired Barbara Bush for years, including for her work promoting literacy . Jessica Queener, who works in special education and wears a cochlear implant to help with hearing loss, said Barbara Bush’s work in education and helping people with disabilities “really resonates with me on a personal level but also professionally.” In Houston for work from Washington, D.C., Queener and her husband decided to attend the public viewing, saying she also credits the former first lady for being a positive influence when her husband signed the Americans with Disabilities Act in 1990. Barbara Bush’s funeral will be held Saturday behind her husband’s presidential library at Texas A&M University, about 100 miles (161 kilometers) northwest of Houston. The burial site is in a gated plot surrounded by trees and near a creek where the couple’s 3-year-old daughter, Robin, who died of leukemia in 1953, is buried. Some 1,500 guests were expected to attend, including first lady Melania Trump, former President Bill Clinton and his wife, Hillary, and former President Barack Obama and his wife, Michelle. Associated Press reporters Michael Graczyk and John L. Mone contributed to this report from Houston.